"That's a really big tree! Is it a conifer, or is it deciduous?" "That's a nice car! Is it red, or is it standard-transmission?" You stand there, perplexed. Even if you have very little knowledge about cars, you know that something is wrong with the question. They started off by asking whether it was a certain colour, and then asked about its transmission! It's fine to ask about each of these things independently, but the question presupposes that the car can either be one or the other. We know intuitively that a car can be a range of colours (e.g., red, blue), and a range of transmissions (e.g., manual, standard). We know, as well, that the two ranges are independent of one another. Similarly, a tree can be from a taxonomic group (e.g., conifer, angiosperm), and have a certain habit (e.g., deciduous, evergreen) In other words, you can have a tree that is coniferous and deciduous, just like you can have a car that is red and standard-transmission! To further illustrate the point, I have created and provided a cross-chart that uses Taxonomic Group as one category, and Habit as the other. For each section, I have added examples from Canadian plants (using my own photos) to help tie everything together. 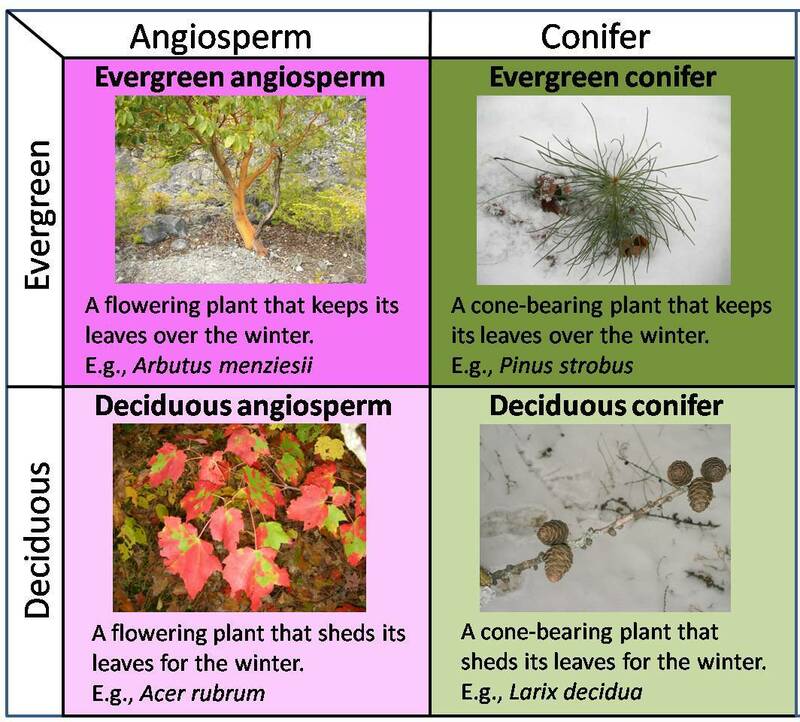 Please keep in mind that the chart I've provided above does not offer complete coverage of all taxonomic groups or plant habits; there are plants that are neither angiosperms nor conifers, and plants that can't be described as being deciduous or evergreen. However, this chart can be used comprehensively for describing any woody plant species in Canada. 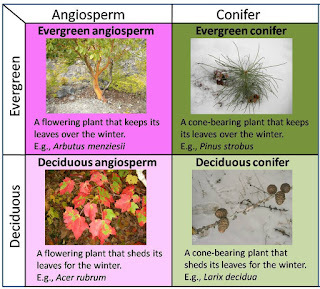 I hope that this chart provides some clarity in discussing Canadian plants and that it gets people thinking about the importance of using scientific terminology appropriately. Feel free to use this chart for educational purposes and to share it with the world!